CASINO PRINCE (AUS) (Bay 2003-Stud 2008). 5 wins-3 at 2, AJC Chipping Norton S., Gr.1. Leading Aust. First Season Sire 2011-12. Sire of 484 rnrs, 324 wnrs, 15 SW, inc. All Too Hard (MRC Caulfield Guineas, Gr.1), Escado, Hooked, Star Rolling, Longport, Mighty Lucky, Casino Dancer, Fine Bubbles, Sookie, Cool Gambler - Lim's Cruiser (Sing. ), Cantbuybetter, Jackpot Prince, Phrases, Slots, Timeless Prince, SP Casino Fourteen, Sweet Deal, etc. Royal Ace (c. by Casino Prince). 8 wins. See below. NORTHERN LANCE (Sovereign Dancer). 4 wins from 6f to 9f, Woodbine Eclipse H., Gr.3, Aqueduct Allowance. Grincheux. 16 wins, US$207,341 in U.S.A.
Yonatowka. 8 wins from 5½f to 8½f in U.S.A. Skip Bail. 4 wins from 5½f to 8½f in U.S.A. Producer. She Can't Wait. 3 wins. See above. Fou de Bassan. 3 wins in U.S.A. BOND JAMES BOND (Old Topper). 7 wins-4 at 2-from 5½f to 1m, US$210,195, Northlands Park Alberta Premier's Futurity, L, Canadian Juvenile S., L, Sales S. (2YOc&g), L, 2d Northlands Park Alberta Breeders' H., L, Three & Four Year Old Sales S., L, 3d Northlands Park Red Diamond Express H., L, Red Diamond Express H.-twice, 4th Northlands Park Western Canada H., L.
Exciting Metro (Carson City). 5 wins-1 at 2-to 7f, US$264,832, Churchill Downs Allowance-3 times, 3d Aqueduct Brutally Frank S., L. Sire. L'Anse au Griffon (Prove Out). 5 wins. See above. ALOUETTE (Malvado). 6 wins from 1400m to 2000m in India, Poona Eve Champion Cup, L, Bombay Breeders' Produce S., L, 3d Bombay Maharaja Sir Harisinghji Trophy, L, Poona Fillies & Mares S., L.
Abiella (Malvado). Winner at 1200m in India, 3d Calcutta Racehorse Owners' Society Champagne S., L.
SWEEPING SUCCESS (Placerville). Horse of the Year in India in 2008. 6 wins from 1200m to 2400m in India, Mumbai Indian One Thousand Guineas, L, Hyderabad Indian Turf Invitation Cup, L, Deccan Derby, L, Mumbai Indian Oaks, L, 2d Mumbai Indian Derby, L, Indian St.Leger, L, Hyderabad Golconda St Leger, L, Mysore One Thousand Guineas, L, 4th Bangalore Fillies Trial S., L, St. Leger, L. Producer. Bernstein (Local Talent). 5 wins from 1100m to 1800m in India and Korea, 3d Bombay Dashmesh & Hargobind Studs Million S., L.
Zeta Jones (Mischevious Music). 4 wins-2 at 2-from 1200m to 1600m in India, 3d Bombay Poonawalla Breeders' Million S., L, Pune Fillies & Mares S., L. Producer. FLASH OF ELEGANCE (Marcus Andronicus). 10 wins-4 at 2-from 1000m to 1600m in India, Chennai Guindy Grand Prix, L.
PREGUNTALE (Le Voyageur). 9 wins-2 at 2-from 1100m to 1600m in Venezuela, La Rinconada Clasico Andres Bello, L, Copa Alighieri, L, Copa Jose Luis Fernandez, L, Copa Jorge Coll Nunez, Trofeo de la UEMN Gran Mariscal, 2d La Rinconada Clasico Lanzarina, L, 3d La Rinconada Copa Miss Marena, L, 4th La Rinconada G.P. Unicria (3YOf), L, Copa Lady & Me, L, Copa Blondy, L. Producer. Race Record: 28 Starts 8-3-3 A$249,175. 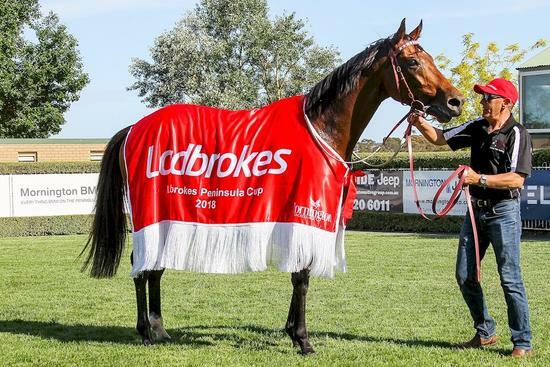 8 wins from 1200m to 1700m, A$249,175, to 2018-19, MRC Mypunter.com H., Ballarat TC Suez McKellar H., 2d MRC Matthew Davies H., MVRC Magnum Opus Partners H., Schweppes H., 3d VRC Bitalli H.